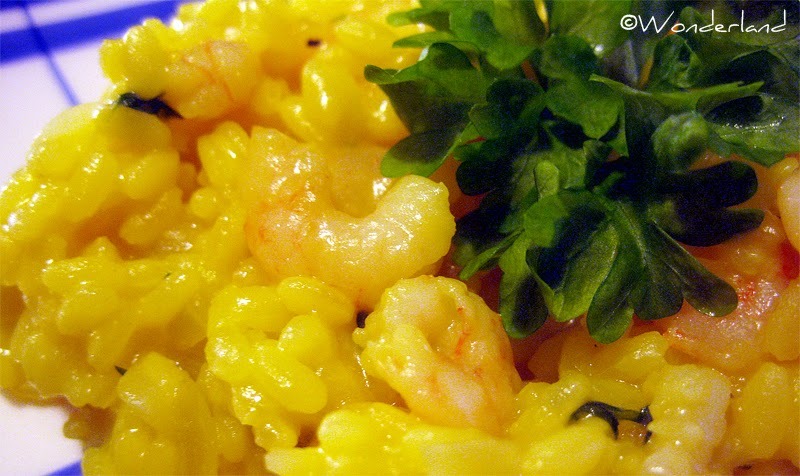 One of our favorite risottos is without doubt this one: risotto with shrimps and saffron! I love saffron, it is probably my favorite spice and I use it often in my dishes: risotto, pasta, main course etc. It's good paired with chicken, with fish and with veggies too! NOTE: In this recipe I use frozen precooked shrimps. If you find fresh ones, you can use those instead. Defrost the shrimps following the package's instructions. Boil the water and drop in it the bouillon cube. In a saucepan saute the chopped garlic for few minutes, add the shrimps and stir. Add pepper and cook until the shrimps are cooked, then turn off the heat. In a big pot heat some oil over medium heat. Add finely chopped onion and saute until it gets soft. 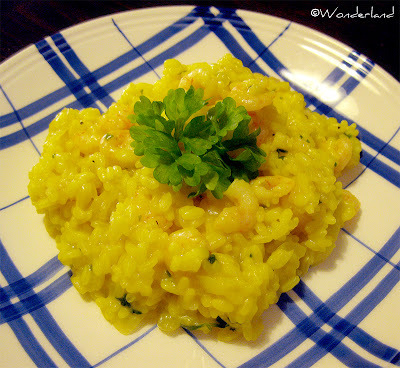 When the rice is almost cooked add the shrimps, parsley, salt and pepper up to taste. When the rice is ready, remove from the heat, cover and let sit for a couple of minutes (this way the risotto gets its fluffy texture).